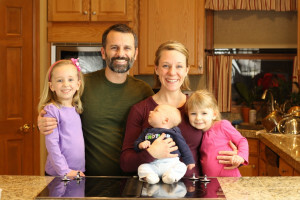 1) Kelli’s side of the family has a tradition of ordering pizza on Sunday nights for dinner, which we’ve carried over by making a gluten-free pizza in our own household. Not every Sunday night. And not always every week. But pretty darn close. 2) I love pizza, and grew up eating my share of it – New York style thin crust, Sicilian, Chicago style deep dish. While we have our favorite go-to pizzas, we’re also always on the hunt for fun new flavor combinations of toppings, or for improved versions of old recipes. In the case of today’s Friday Foto recipe, we – or should I say, I – was on a quest. During my childhood, we’d sometimes go out for dinner to a pizza place called My Pie. They made some of the best deep dish pizza I’ve ever had. It started out in the Midwest, and eventually grew to some 40 locations across a good chunk of the country. Apparently, those places are all gone now, save for one or two My Pie II locations run by the original founder’s son, which resemble nothing like the My Pie I went to more than 20 years ago. The flavors of that pizza still come to me after all these years. And yet, those flavors are something I’ve never had in a gluten-free pizza. It was time to change that. I started doing some research. 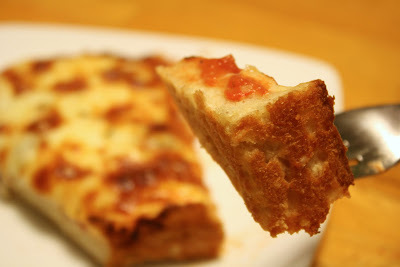 What made deep dish pizzas like the one at My Pie taste so distinctive? How could I authentically translate those secrets – whatever they were – into an awesome gluten-free pizza? 1) I wanted a gluten-free dough that I could press into the pan with my hands, and which required little or no par-baking before adding the sauce, cheese and toppings. 2) I wanted heat – I’m talking 500 degrees Fahrenheit – in order to mimic the intense fire of a proper pizza oven. 3) I wanted a sauce that was fresh – never cooked, boiled, or otherwise heated – before it was added to the pizza. Finally 5) The pizza needed a healthy dose of dried oregano and dried basil. 1. Preheat the oven to 500 deg F.
2. In a large bowl, combine the water, sugar and yeast. Let stand for five minutes, allowing the yeast to activate and become foamy. 3. Stir in the olive oil, xanthan gum and salt. 4. Mix in the flour to form a dough. Drizzle lightly with olive oil, and roll to coat. 5. Generously olive oil the bottom and sides of a 9×13-inch baking pan. Press the dough into the pan, and use your fingers to work up a 1/2-inch lip around the edges to contain the sauce, cheese and toppings. 7a. Add the sauce, oregano, basil, cheese, and toppings, and bake for 20 minutes. 7b. Par-bake the naked crust for 5 minutes. Then add the sauce, oregano, basil, cheese, and toppings, and bake for 15 additional minutes. 8. Let sit for 5 to 10 minutes before slicing. This recipe is: gluten-free, egg-free, peanut-free, tree-nut-free, fish-free, shellfish-free. 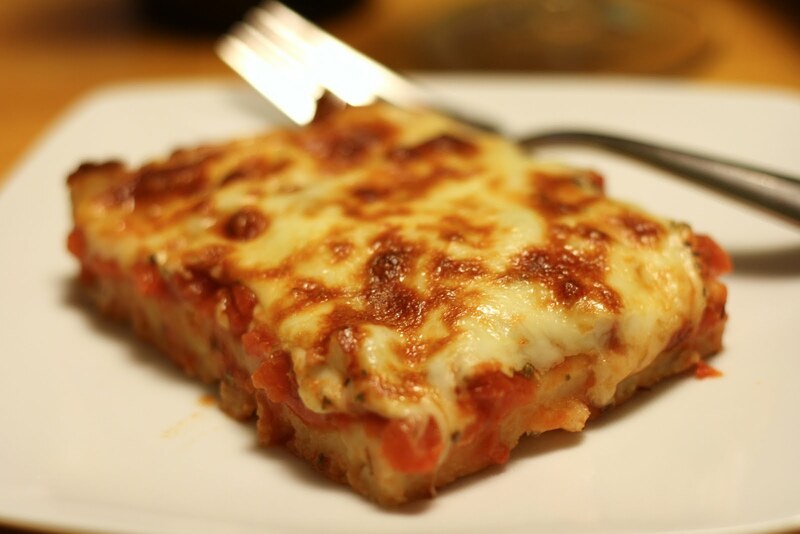 Note: For the San Marzano tomato sauce, either used diced tomatoes for a chunky pizza sauce, or use a handheld immersion blender (or other method) to puree diced or whole SM tomatoes to make a smooth pizza sauce. I’m glad you and Kelli go through all this searching and testing to figure out the best pizza crust and sauce for the rest of us. Sounds like quite a quest you’ve been on. I’m thrilled to be the beneficiary! Those SM tomatoes sound pretty special. You’re not nit-picky if they’re that good. I’d call you discerning and your cookbook proves you’re on the right track with food. I can’t wait to give these tomatoes a try. I think it’s going to be a pizza weekend! Have a nice holiday! This pizza looks awesome. Pizza is definitely what I miss most being gluten free. Every gluten free pizza I have tasted tastes like gluten free pizza. Not bad necessarily but not like real pizza either. I’m looking forward to giving this a try! Thanks. Oh, btw, your brother in law is the best supermarket manager ever! He has been so helpful to me since my celiac diagnosis in 2009! He introduced me to your blog as well, which I enjoy tremendously. I loved your original deep-dish from the cookbook… look forward to this one. But I’ve never heard of SM tomatoes. Are they a specialty item? Is there someplace I should be able to find them? your flour blend has 1tsp. xantham gum, but for the pizza dough we need to add 2 more ? just checking before I try your dough. looks great ! thanks. Hi Sharon… Enjoy the pizza recipe! Yes, Peter is great! Glad to hear he’s been helpful for you after your diagnosis. 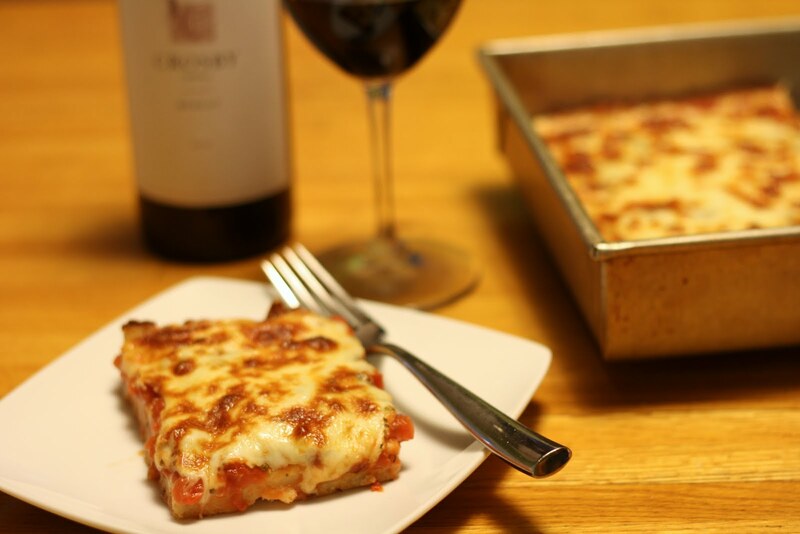 Hi Claudette… If you loved the original deep dish pizza from our cookbook, I suspect you’ll love this one as well! The SM tomatoes are a bit of a specialty item, but we find that most supermarkets carry them, even if in only small quantities. Look for them on the margins of the canned tomato section. Hi Leigh… You’re correct. Our flour blend includes a small baseline level of xanthan gum (1 tsp per 3 cups flour). The 2 tsp called for in the recipe is supplemental additional xanthan gum. Happy pizza pie baking! YUM! I had a pizza disaster last night, so today I’m seeing pizza everywhere! Pete, like everyone else, I’m happy to be the benefactor of your and Kelli’s dedication to creating the best pizza recipe. 😉 This pizza does look fabulous! I’m not one who usually wants to deal with yeast recipes, but your recipe doesn’t look hard at all. I’ve heard of the SM tomatoes, but not sure if I’ve ever eaten any. I’d probably remember if I had, right? Will be on the lookout and will make this pizza soon–can’t wait! Wow, this looks absolutely fabulous!!! I think I will have to try this recipe. I have been searching for the perfect GF pizza crust for 15 years and this looks like it could come awfully close! As for the San Marzano tomatoes, they are the best. I grow them every year, they’re an heirloom variety. Worth finding. And some of the best paste tomatoes around for home canning. Glad you’ve discovered them! Oh heck yes. I was going to try the deep dish pizza from your book this weekend, but I might try this instead. Or I might make both and see which I like better. Can’t wait! I am going to make this for my daughter’s birthday this weekend! Is the sauce just pureed SM tomatoes? Nothing else? Thanks! Hi Theresa… We’re coming up with reasons all the time to make yet another pizza! Enjoy! Hi BeyondRiceandTofu… I hope this pizza takes you a big step in the right direction in your 15-year quest for great GF pizza! That’s great that you grow your own SM tomatoes. I’m hopeful for ours in the garden this year, though they’re growing the slowest of our tomato varieties. Do you find this as well? Interestingly I think the dough for this pizza is rising better than the bread recipe! LOL Maybe it’s the sugar as the yeast has plenty to feast on. I found the can of SM tomatoes with the basil leaf in them. The yellow can. It was a bigger can than I needed though, so I’ll save half of the sauce for making tomato soup or something else with. As soon as I pureed the whole tomatoes I could tell they’d make a delicious tomato soup. Hi Amanda… Glad you’re getting a good rise out of the pizza dough! (I took some pictures of the sandwich bread I need to send you, by the way.) Yes, the Italian imported tomatoes come in a larger can. We did the same thing – save half for later. Good stuff! Wow, this dough rises so well! I couldn’t find the San Marzano tomatoes anywhere in town, but I went ahead with the rest of the recipe and used my favorite pizza sauce. I used a low moisture mozzarella and followed step 7b, but the cheese still burned. No matter — next time I’ll parbake for 10 minutes and add the cheese and toppings in the last 10 minutes. The crust was great. Next time I go to the big city, I’ll stock up on the SM tomatoes. Thanks, Pete! The pizza went over very well! Next time I may bake it for about 5 more minutes just to get the bottom crust a little more done. However, it was perfectly fine eaten with a fork. I loved how the top actually looked like a pan pizza you’d get at a chain with all of the dark spots and the bubbling action. Those tomatoes are awesome! I’m going to have to find some seeds for them. This looks heavenly! I wish I could make it but I can’t figure out where to find the recipe for your flour blend… is it in your cookbook? Hi Melissa… I find the bake time can vary depending on so many factors. I recently made one pizza that par baked for 5 min and then with toppings for 12, for 17 minutes total bake time. Last night we made a pizza that baked for 19-20 minutes straight up, with no par bake. It all depends. But anything over 15 min total is good for the dough… Glad you enjoyed it! Hi Amanda… Sounds good! Yeah, the SM tomatoes are awesome. We have some growing in our garden. I’m hopeful they’ll do well! Hi Chris… Yes, the flour recipe is in both of our cookbooks. It’s also here on the blog. I meant to link to it. Sorry about that. I’ve updated the blog post so that it links over to the flour blend recipe. Enjoy! I have type 1 diabetes and just added going gluten free to my challenges. I have to count every carb to calculate how much insulin I need every time I eat. Your recipes are great. One thing you could add to help those in my shoes is carb counts on your recipes. Nutritional information is really useful for so many of us. Hi Zima… Thanks for your note. We’ll definitely consider adding such nutritional info to future recipes. Up until now, we haven’t included such info for two primary reasons – it’s not our “style,” and limitations on our time. It’s difficult to be all things to all readers, who request GF, dairy-free, egg-free, vegan, diabetic, etc. types of info for our recipes. But I absolutely understand where you’re coming from, and we’ll strive to take your considerations into account as we develop and post new recipes here on No Gluten, No Problem. Hi Michele… Thanks for your comment! Normally I’d absolutely agree with you. The soil (terroir, as you rightly note) is just as important as the seed in the flavor profile of Italian San Marzano tomatoes. But I was surprised by how remarkably similar the US-grown San Marzanos I’ve had taste. The flavor profile nearly, if not exactly, identical…leading me – in this case at least – to believe that the seed supersedes the soil in determining the flavor of SM tomatoes. Regardless, they’re delicious! You asked me a while back about how my SM tomatoes grew. They are a determinate variety (vs indeterminate) so they probably growing differently (more compact/smaller) compared to your other varieties. Determinate means that they will set fruit and ripen generally all at once whereas your other tomato types (indeterminate) will set fruit throughout the season. Paste/plum tomatoes like SM’s are usually determinate so that you get a whole slew of tomatoes all at once and then you can process and can them. That’s the thinking anyway. This is the first gluten free pizza I’ve made and it was really top class. I was wondering if it is practical to make the dough ahead of time? I’d love to be able to prepare everything earlier in the day so that all I need to do at dinner time is assemble. Have you ever tried it? Hi Cocoanut… Your best bet would be to par-bake the crust earlier in the day, then finish the pizza(s) later in the evening when you’re ready to eat. Because the dough has a vigorous rise, I don’t think you’d want to prep it early in the day and let it sit in the fridge without forming it into the pan and at least “setting” the crust with a par-bake. Hi, when you say “Mixin the flour to form a dough. Drizzle lightly with olive oil, and roll to coat”, what exactly do you mean? Do you use a mixer and, if so, for how long and on what setting? Is there a risk of over-mixing? Hi Anonymous… If one of our recipes ever requires a stand mixer, the recipe will specifically call for one. Otherwise, mix as you’d like. In practice, we always mix the pizza dough by hand. Mix in the flour to form a dough. Drizzle the dough ball, or the sides of the mixing bowl, or both, with a bit of olive oil. Then roll the dough ball around to coat it with olive oil on all sides. Bada bing, bada boom, you’re ready to form your crust. 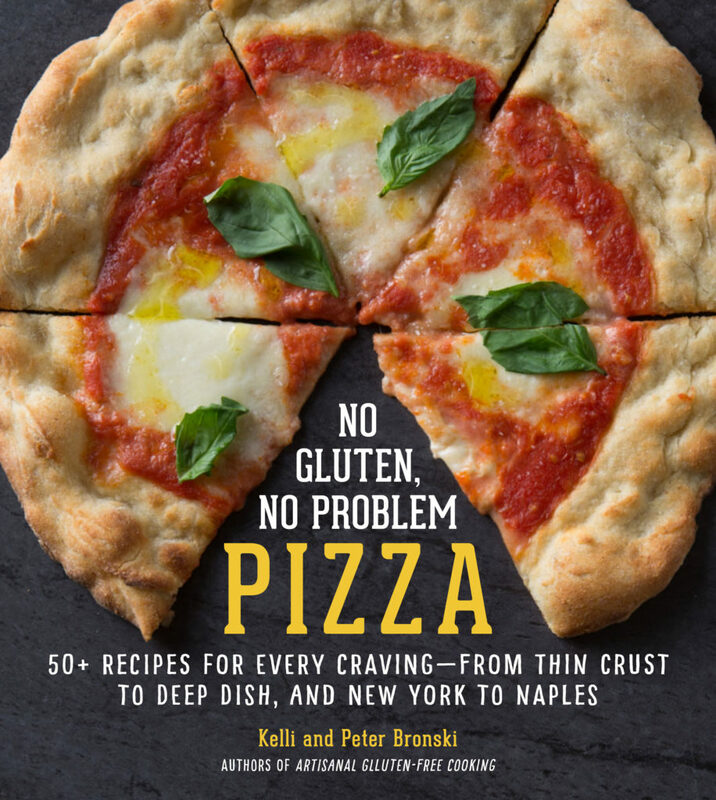 I am new to the gluten free diet (about 3 months or so), but since then I have been on the search for good recipes and good pizza. I tried your recipe the other night and it was a flop. The tomato sauce and toppings were awesome, but the pizza crust was aweful. It didn’t bake through. I made the recipe to the T, but it didn’t bake through. Do you have any suggestions? I’m wondering if I should have par-baked longer than 5 minutes? Could I make this dough on a pizza stone and spread it out thinner for it to come out? I’ve tried so many pizza recipes, but the dough just doesn’t come out right. I miss good pizza. Hi Anonymous… If you’re baking the pizza for at least 20 minutes of total oven time, there’s no reason it shouldn’t bake all the way through. Is your oven actually reaching 500 degrees? If you don’t already have one, consider getting a small oven thermometer to place on the middle rack of the oven and make sure it’s reaching the proper temperature. 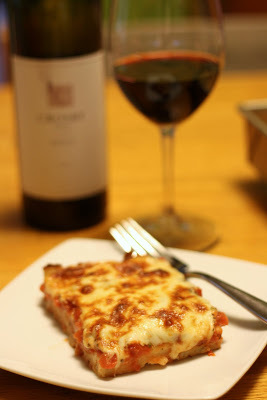 You can also par bake the crust for 10-12 minutes before adding the sauce and cheese. And yes, you can use the same dough to make a thin crust pizza. We typically par bake the crust on a pizza pan, then add toppings and finish the pizza directly on a pizza stone. Enjoy! Is it essential that I use Artisan GLUTEN-FREE FLOUR BLEND or can I use another brand gluten free flour blend? Thanks, this sounds delish! We create all of our recipes using our flour blend, however, you can certainly use another blend and see how it turns out! I just had to comment, because I made this recipe last week and it was AMAZING! We devoured almost every slice. Hubby cannot have gluten and pizza was one thing he was missing most. This was unbelievably good, and I can’t thank you enough for a gluten free pizza that actually tastes great! Would I be able to use the flour from Gluten Free Girl for this pizza? We haven’t tested the recipe with that particular flour blend. There are some differences between that flour blend and our own, but pizza dough can be pretty forgiving, so it’s worth trying!